Hey, welcome to the weekly column digging into the offerings on the Criterion Collection's Hulu Plus Channel. This week, we'll look at Charlie Chaplin's The Circus, which represents a sort of in-between mark of Criterion licensing. When Criterion hinted over a year and a half ago that they'd be putting out new editions of Chaplin's films, there was (rightfully) a lot of celebration. The old MK2 DVDs were serviceable - they sported fine transfers for their time, and included a bounty of extras. But few are able to match what Criterion does, and this was a near-guarantee of seeing these films in high definition. Among the first offerings by Criterion on Hulu were several Chaplin films - The Great Dictator, Modern Times, A Woman in Paris, City Lights, and The Circus among them - but only Modern Times used a new HD transfer. The rest were sourced from the MK2 discs (I've tried contacting Criterion to see if they plan on updating those files as they create new transfers, but received no response). And while those transfers were serviceable on DVD back in the day, they're pushing it on streaming. But first, let's dive into the film itself. The Circus begins with one of Chaplin's finest, most lyrical images - a girl standing on the suspended rings, swinging back and forth as music plays and the credits roll. It's an arresting image to begin on, and it hints at the emotional current of the picture to come. The girls eye project longing for a better future and sadness at her present situation, in which she's stuck swinging back and forth. Though in many ways, this image would be better suited to the Tramp (as much as he advances, he's doomed to regress), having him up there would be more silly than touching. Chaplin's famous character enters the film as he usually does - out of work, conniving for scraps of food. He'll soon (it's only a 71-minute film after all!) land work in the circus as a performer, though he won't know it. He's instead hired as a prop man and, because he can't help but wreck the whole show, the audience loves him. Chaplin's great victory with the Tramp over his many years is toeing the line between gaining audience sympathy while still letting us laugh at his misadventures, and this film presents that wrought large. The gags absolutely land. Chaplin starts big with a police foot chase that's as clever as anything he's done in how characters intersect, part, reappear, transfer props, and so on over the course of the chase (and as a side note, these are exactly the kind of things that classic comedy junkies like me mourn the loss over in the rise of Apatow). Physical comedy gets a bad rap these days, both by its viewers and those who utilize it most, but in a visual medium, there are few things as satisfying as a well-executed, physically-driven joke. But it also obeys the primary rule of cinema (which itself is most chiefly trotted out by people who don't understand what it means) - show, don't tell. Character and philosophy are revealed through action, not speeches. Those who prefer Buster Keaton over Chaplin tend to note that the former's philosophical angle is more interesting, that he specializes in characters whose lives are determined and redirected by forces greater than their own (the train in The General, the storm in Steamboat Bill, Jr.). 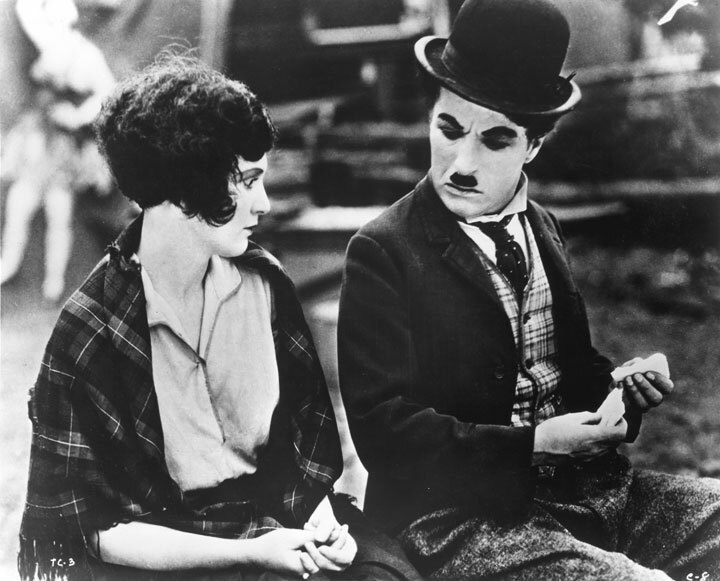 But I've rarely found that Chaplin, for all his emotion, engages with any more forceful in terms of fate vs. free will. Looks at Modern Times, City Lights, even The Kid - his films are a little more sentimental than Keaton's, sure, but any major gains he eventually encounters are as much, if not more, due to luck, circumstance, and fate rather than his own personal determination. All of the Tramp's success in The Circus is a direct result of an accident or misunderstanding. He gets the job at the circus after being chased in there by a policeman and subsequently wrecking the show. His continued success there is buoyed by the girl (the same one from the film's opening shot) who he loves, and he mistakenly believes love him, too. Perhaps it is because of this bedrock that the film's conclusion feels so false, so forced. After getting kicked out of the circus, the Tramp goes back to his hobo ways. He is soon joined by the girl, who declares her determination to stick it out with him. The Tramp, realizing that, although this is his dream, he really has no means by which to provide for her. So instead he rushes back to the circus, begging her tightrope-walking former boyfriend to marry her, so that he may give her the life the Tramp cannot. The tightrope walker accepts, proposes to the girl, and they go on to live happily ever after. The girl returns to the circus, but insists that her father, the circus manager, takes the Tramp back into his employ as well. The manager begrudgingly agrees, telling the Tramp to get on the last car as the caravan moves out. The Tramp waits for the cars to pass, and then simply walks off into the distance. For a movie all about accidents and fate, the ending of The Circus feels too heroic. The grand gesture doesn't feel earned. It doesn't negate the film as a whole, but perhaps the emotion wasn't built into the film early on, perhaps the Tramp wasn't as well-developed this time out; I'm not sure. It simply feels forced, an ending crammed into a story that cannot support it. A slight misstep at the end hardly undoes Chaplin's many achievements here, though. The Circus remains a pretty great motion picture. The transfer on Hulu, which is advertised as being in HD, varies wildly. Sometimes it absolutely delivers, but too often it settles for low-level DVD quality. This is certainly due to the using the MK2 source rather than a new one (the film opens with their logo), so I'm very much looking to what Criterion does with it if and when they put it out on DVD and Blu-Ray. I don't mind a digital presentation of a film looking rough, so long as it still looks like film (I'm a grain monk myself), but this too often looks more like video. It hardly destroys the film, which is still in its correct aspect ratio and free from major damage, but it's just uneven and nothing extraordinary. But then again, they don't all have to be. Charlie Chaplin is considered the best comedy actor of the century as he did the best with his character and he did when, there was no audio on the screen. You have mentioned absolutely right about the starting scene of the films and his wrecking character, which people liked the most. Every time i watch his film, it takes me to the most amazing tour programs of past.